I've really been enjoying the KNIT Magazine sock club so far. The patterns haven't really caught my attention, but the yarns have been awesome. The first two shipments were Skein Queen and The Yarn Yard. The third installment is HipKnits. 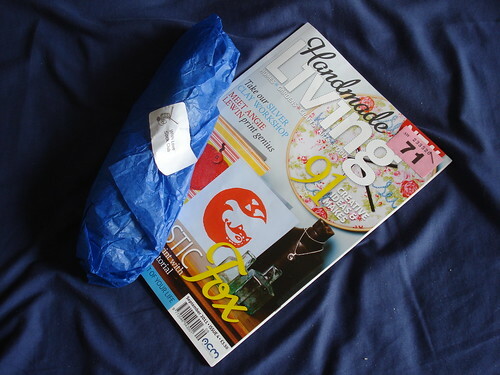 There were some exciting extras in my package -- firstly, and most apparently when the parcel arrived, a copy of the new issue of Handmade Living. It's a lovely mag, even if I don't do many craft things other than knitting. The highlight of the mag for me is an interview with Susan Crawford, author of the Stitch in Time books! They've also included a fair isle sweater pattern from the first book. (Frustratingly, as a vintage pattern, no charts! Agh!) There are also some nice recipes, including red velvet cupcakes. Mmm. Everyone got different colors, so it was still a mystery to me what my yarn would be even after seeing some other peoples' yarns on Ravelry. Mine turned out to be a muted green and gray variegated. It's a nice fat sock yarn, 100% organic merino. I'm not sure what I'll do with it, yet, but I'll think of something.